I love history and how HBO docudrama films captures the past. John Adams and From the Earth to the Moon mini series probably my favorite put out by HBO. 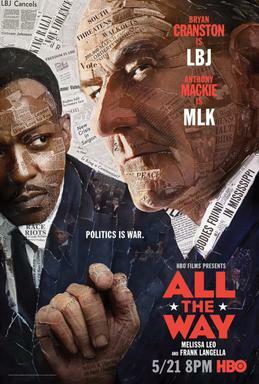 Though I have mixed feelings on some of President Johnson's policies, a well told multiple level story and superb acting. This is the third film I had watched from the last day of President Kennedy era that did not recreate the famous taking oath of office on board Air Force One. A powerful image that I would have liked to see in a movie; maybe the snapshot should just remain in that timeless photo? Well, I'll start by saying I enjoyed this Netflix film more than I expected. The universe in Bright is what most readers would call Urban Fiction. This is a popular book genre right now. To give you a better idea, the first novel series that comes to mind is The Dresden Files. You have a wizard fighting the underground supernatural in modern day Chicago. Here is where Bright differs... the supernatural and fantasy elements are out in the open. You have orcs and elves living beside humans in modern day LA. This creates intense rivalries between races as they call them. Also, many of the urban fiction novels are aimed at young adults... Bright is straight up R rated with drugs, guns, violence, gangs, F bombs, and strip clubs. This is one of the movies where the title itself holds significance, and I can't reference this aspect without exposing decent plot line spoilers outside of the original trailers. At its core, the first Orc to join the police department is Will Smith's (portraying Office Ward) partner. They are catching heat from all races on this when they stumble into a safe house containing an object way over their heads. They get stuck in the middle of an all out battle and somehow manage to drag even more parties into the ensuing craziness. Overall, if you're a fan of fantasy or the urban fiction craze, but want something a little less PG13 and more R rated gritty, this is up your alley. I should note, I am a fan of the Dresden Files and similar urban fiction book series, so perhaps I am a bit partial to the background this movie occurs on. The Will Smith jokes and situational humor between the main characters are both mixed in well. I never felt it was forced and added levity to a movie that was otherwise had very light bright spots (see what I did there ). This is one of those polarizing movies: 27% on Rotten Tomatoes by critics but 86% of the audience liked it. While it wasn't amazing, it was a fun, Sunday night Netflix movie. I'll be tuning in to the sequel when it is released. Urban fantasy, not urban fiction. Otherwise I read ya. marurun wrote: Urban fantasy, not urban fiction. Otherwise I read ya. Yeah that's it. Mrs Jago loves that book genre. I bet she has 10+ series she keeps up with. When she saw the trailer she said "it looks like one of my books!" I enjoyed the movie. It took the concept of the 80s show Alienation but switched it up with Orcs and Elves. You guys mean the Shadowrun movie? No, it's the movie that seemed like the Shadowrun movie in the trailer but couldn't get the license so they tweaked it so that the magic has always been there but the entirety of world history didn't change one iota. MrPopo wrote: No, it's the movie that seemed like the Shadowrun movie in the trailer but couldn't get the license so they tweaked it so that the magic has always been there but the entirety of world history didn't change one iota. what did I just watch!!?? I just finished the Cloverfield Paradox. Here are my spoilery thoughts.